When we stop and think about what we’ve done and where we have been in 2018 we start to be just a little jealous of ourselves. We are always asking ourselves, who gets to do this? Well, we do! Then we consider the reality and realize that we did an enormous amount of work to get to France, The Netherlands, Italy, and Israel each twice with all our people. So, in the end, we are jealous of ourselves only in that we each have the energy follow our passion so completely so that we can travel with our art and our friends to such inspiring places. We are truly grateful for everyone that has joined with us on these adventures. Together we have seen so much, grown so much, not to mention the innumerable drawings and paintings that were created by everyone. As we come to the close of the 2018 season, we have a few more things to do, but we look forward to 2019 with much excitement. • What Have We Been Up To? This fall we started off with an amazing experience in Baveno on Lago Maggiore in Northern Italy. We worked with a group of 18 women organized by Irit Shaked. It was amazing to work in such a beautiful place. Following our Italian adventure, we got on a plane and flew to Israel where we still are actually while we are writing this newsletter. So far we have had two great workshops. One was our Finding Expressionism Workshop in Tel Aviv. There we had a couple days of real creative exploration. Yesterday we finished up a woman’s painting workshop with Irit Shaked again in Jerusalem this time. For this workshop, we focused on the work of the Israeli artist, Anna Ticho, who painted nearly 6 decades in the landscape around Jerusalem. We are so energized by the retreats and workshops we have held so far this year. There are a couple of more workshops in store before the end of our year. We sure hope that you can join us. We would love to have you with us. This will be a very special version of this workshop that we have presented so many times before. We will begin by exploring as a group how the rhythms and textures of the music can shape our artwork. These initial exercises will use a number of different art materials from pastels to paint. During the second half of the workshop, artists will individually on their own canvases in the painting materials of their choice. Royce and Tali will give demonstrations of their style of painting with music. Above all, this workshop will celebrate creativity and self-expression. Come prepared for an enthusiastic day of art making. Email us at: info@ArtisTTableOnline.com for registration for this special one day workshop. Description: In this class, Royce introduces the participants to the medium gouache for those new to this opaque water-based paint. Advanced participants can deepen in the medium under the direction of Royce. First of all, there are many ways of working with this unique medium. Gouache is water-based but dries faster than other types of paint such as watercolor, acrylic or oil paint. You can apply it in thick layers or spread it thinly. Light colors can be applied over dark colors. Thanks to these characteristics, Gouache is a flexible medium with which the artist can work very varied. Contact us at info@ArtisTTableOnline.com if you are interested in getting in on this class. Lunch will served and all the materials you will need will be supplied. The Provence is a special part of France and is filled with a light that has captivated artists from around the world for years and it will captivate you too. Two of the most notable residents of the region were Vincent Van Gogh and Paul Cézanne. Vincent took up residency in Arles and St. Remy and Cézanne was born and raised in Aix-en-Provence and then came back from Paris to paint there the rest of his life. We will visit and paint in many of the locations where Vincent worked. Then we will go east and visit Cézanne’s studio, and switch our focus to getting out in the field to paint the landscape around Mont Sainte-Victoire that inspired so many of Cézanne’s paintings. The Dutch landscape is classically beautiful in so many ways. It has been the subject of painters for centuries. 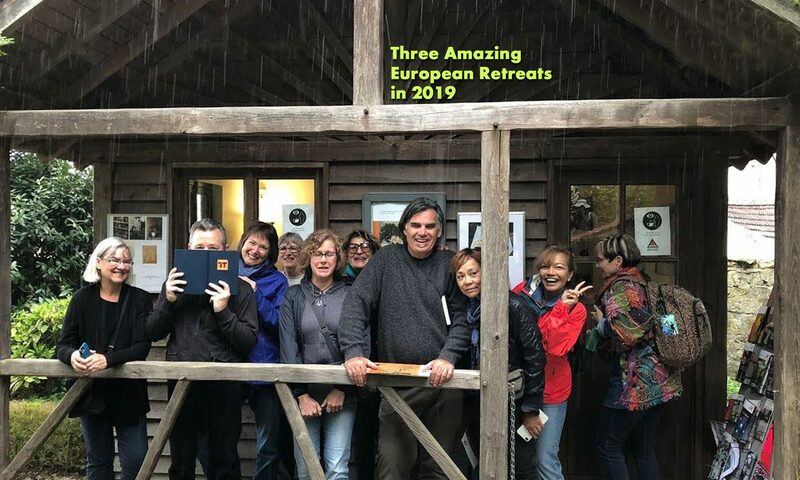 Join us on this retreat and you will have the opportunity to paint from pastoral farmland to lush forests, the river banks of the Ijssel River and classically Dutch architecture in the old city center of Zwolle. Zwolle is located in the center of the country and boasts the highest bicycle per capita in the Netherlands. So we will be getting around as much as we can on bikes. If you are interested in a wide variety of locations and subject then this is the retreat for you. We always are looking for new places to go that will give new artistic experiences. We have been looking at going to Spain and specifically at Granada for a couple years now. Aside from just being a beautiful mountain city, the culture of flamenco is very strong there, not to mention that it is home to the Alhambra as well. We have partnered with the Escuela Carmen de las Cuevas, and will be staying in their housing and everyone that joins us on this retreat will be participating in a special introduction to flamenco class. Our goal on this retreat is to immerse you in the rich culture that exists in Granada. From there we will be focusing our efforts on drawing and painting the city, the views of nature as seen from the city. We will go sketching the city and its nightlife when the sun goes down. And of course, we will visit the Alhambra with all of its grandeur. Congratulations to Laila Kujala for winning the People’s Choice Award in our HERSTORY exhibition. Click here to see Laila’s Earth Woman painting and the rest of the show. The next call for entries has been published for our 31st exhibition, Water. It is an all media show with water as the theme. You may submit up to 5 pieces for the single entry fee of $25 US. The submission deadline for this show is September 9th. Click here to register. Contact us if you need a few extra days. Most recently, our art workshop in Jerusalem connected us to a wonderful Israeli artist, Anna Ticho. She was born in the Czech Republic, 27 October 1894 and died in Jerusalem, 01 March 1980. She was a vibrant artist that was indeed ahead of her time. She was seemingly fearless as she would go out into the hills around Jerusalem as a single woman to draw and paint. Truly a feminist pioneer. The local Palestinian sheep herders didn’t know what to make of her because she was so different. There is a lot to study about this interesting woman, and we will continue to investigate, but for the intentions of our Jerusalem workshop, we were really taken by the way that she interpreted the landscape that she lived and loved. So typical to her style of working was to focus on a specific part of the landscape where the contours of two hills met, and then only give us enough to understand that relationship. She allows us as viewers to fill in all the rest of the blanks. Please check out the few pieces of her work that we have shared here, and if you are in Jerusalem, stop by Ticho House (Beit Ticho) because right now there is a wonderful retrospective of her work there on display. Oh, and entry is free.